She was speaking quietly to herself as I parked my car in the early afternoon of March 11th, 1985, in Vancouver, British Columbia, Canada. She was about 60, small, rather sinewy and sallow and without makeup. Her hat was blue and fresh-looking. She wore a long cotton dress, maroon, with a flowered design, and a black cloth jacket. On the front of her jacket there were several badges which I have illustrated from memory. I have also illustrated an obos, of which she speaks, because it may not be familiar to everyone. I followed her for 35 minutes. She spoke kindly and softly, often in a patient, explanatory tone. Her statements were spaced, confident and informed as if well rehearsed. At times, unexpected words were emphasized in the style of some preachers. Some statements were very quiet—almost inaudible. She chose not to notice me, and despite the friendliness of the words there was no eye contact. Her occasional smile was not for me. We proceeded north, from the 900 block Richards Street until reaching Hastings Street, where she turned left and left again onto Seymour Street proceeding south. At Helmcken Street she crossed over to the other side. She stopped speaking just before Davie Street, where she turned right. I followed her for a minute or so, then returned to my car. I never saw her again. I’ve edited only slightly to improve the grammar. I don’t think the meaning was tampered with or adjusted in any way. Where statements were very quiet I have placed brackets around what I thought I heard. Completely unclear statements due to traffic or mumbling have been left out; these are shown with an asterisk. The numbering of the items was my idea. I played the tape several times and took care copying it out. The material was recorded on a UHER CR 240 with a hand-held microphone. The tape was later recorded over by one of my children. The general quality and nobility of the material impresses me as do many of the individual items. There is a curious, poetic thoughtfulness, which on re-reading, is often haunting. There are peculiar specifics and evident prejudices. What I overheard was at once erudite and naïve, original and derivative, clear and mysterious. I was impressed with the place she describes. It’s curious to me that while this woman seemed sure of what the place could be, she herself did not seem to be of that place. This bothered me then and it still does. On pathways or highways, particularly during chance encounters with others, certain of these items come back to my consciousness. The dreamway gives a signal and its eyes smile. The dreamway offers a connection with you. You connect with others (along) the dreamway. There are loving neighbours along the dreamway, and strangers which you must learn to love. The dreamway accepts your choosing. All manner of humanity are with you on the dreamway. Your eyes will bear overcoming and you also will overcome on the dreamway. May I walk with you along the dreamway? There is the serious path and the humourous path, and opportunists take both. There is a river of joy, a river of love, and a river of transfiguration. My eyes and your eyes connect with ease along the dreamway. There is a facility in gift handling on the way of dreams. Wishing so, we call to one another on the dreamway. We honour each other’s silences on the dreamway. There is wealth of friendship on the dreamway. The beauty of your skin is not your gift on the dreamway. When your feet are sore and swollen on the dreamway, the pain is more easily borne. Fleeting conversations drift on the winds that blow along the dreamway. Ourselves, and the profuse family of life are the glory of the dreamway. Something goes back and forth between us on the dreamway. There are vacant thrones on the dreamway where a weary traveller can for awhile rest and enjoy. While moving on the dreamway, we pass masters, and catch up with other masters, and learn leaderlessness. If all were as peaceful as the dreamway, that would be peace enough for the world. It is a dreamway to feel and a dreamway to be. You can ride on streetcars on the dreamway, or you can lead on foot. The dust of the dreamway is our own dust, early or late. On the dreamway, lanterns shine in spite of their sober covers. There are fliers to the dreamway sun who have escaped from their tedious prisons. There are also escapees on (chargers of new habit who dodge the rack) just by being on the dreamway. Your eyes are mine and we see each other’s dreamway souls. There is no fear of solitude for even when we are solitary, we are not alone on the dreamway. On the dreamway, we can catch gifts as they float nearby. Life pulses in the rich undergrowth beside the dreamway. Sometimes we are unavoidably delayed on the dreamway for the sake of poetry and song. Soft and gentle music can be heard above the jackhammers on the dreamway. Some wayfarers stagger with the weight of many poems, others travel faster with more. Speed is not important on the dreamway. Poems are popular currency you see traded along the dreamway. The dreamway’s mind holds more joys than the pinholes of light in the clear midnight’s infinity. Through the same eyes, the child and the adult view the clumps of grass on the dreamway’s verge. The children of the dreamway are celebrating the pebbles and the running water. A handful of sand feels new on the dreamway. Sheer movement does not give the illusion of (so much) progress on the dreamway. The inhalation of poetry and the general public drunkenness of song are the problematic hazards of the dreamway. The announcer and the listener both know the joy of the dreamway’s spoken word. The dreamed joke along the way; there is no total disclosure. On the rocky shores of the dreamway, crystals of like facet cling to each other in the dearest intimacy. Acrobats walk a tightrope of self and selflessness above the dreamway. It can only be partially dreamed, and it cannot be properly catalogued; the wonder of the dreamway. You cannot catch it or hold it, even when it is well seen on the dreamway. “Happy Birthday” is sung with frequency along the dreamway, without any apparent regard for timeliness. Plain and uncut crystals vie with diamonds in the dreamway. Two truths stride arm in arm and become lucky on the dreamway. And we pass the unadorned tomb of unlovingness. On the dreamway, speakers are often speechless and merely give of themselves, while givers are giftless and have learned to love the sound of their own true voice. There is a serious mode and a humourous mode on the dreamway, and the tears of joy and the tears of sorrow are never completely used up. An elderly dreamway-farer proudly wears a badge given to himself for the way he feels. Our given names on the dreamway are not permanent names. While there is often a crowd on the dreamway, it is never fully crowded. Strollers on the dreamway often take action to take no action. Two by two, two by two, they stride arm in arm, arm in arm on the dreamway. Non-contending males help with the anti-litter program of the dreamway. The dreamway becomes water and shows us how it flows anywhere lower. Generosity and kindness come easily to the charmed and bountiful of the dreamway. When the dreamway is iced over, there is great merriment as the tentative cross gingerly. Loved ones are released to become travellers on their own dreamway. (In the homes along the dreamway) guests are seen to be proper for awhile. Dreamway entrances and exits are often accomplished with a disarming surprise. No one rules the dreamway, all are unruled, but they are not unruly. On the dreamway, there is no tax, but all give freely when they see need. On the dreamway, many are building their own leaky boats, and some are seen putting to sea in them. On the dreamway, (it is a privilege to honour ones) favourite charities. “In the name of all that is good” is an oath given in the saloons and the churches of the dreamway. On the dreamway, late of night, by carried lamps are soft connections made. Customs brokers on the lines of the dreamway attend with their binoculars to the migration of geese and swans. The police on the dreamway are sheepish and go with the crowd. Curiosity seekers on the dreamway attend the museums of kingdom and statehood. Groupings on the dreamway change their loyalties like flights of speedy sandpipers. On the dreamway, a lot of time is seen to be wasted as everyone feels he has the right to negotiate his own deal himself. Hunchbacks dance with deposed governors during a parade along the dreamway. Dreamway beings are only seldom in the wasting mode, and even then they help clean up for fun. Most of the progress on the dreamway is in the transition from the wasting to the producing mode. “Let us see how simultaneously we can sheath our daggers,” say two warriors on the dreamway. And fighters on the dreamway are rewarded for bringing campaigns to swift conclusion without a fight. Many on the dreamway can be seen to be holding on to a great warm unexplainable something. Entertainers and restauranteurs are honoured and even decorated on the dreamway. The dreamway is filled with ones who are prepared for laughter. The parts of the dreamway are there and in place but the whole of the dreamway is marvelous. On the way of dreams: One to another, and another, and another till many. On the dreamway, a miraculous male and a miraculous female sway together in one miraculous dance. Contentment (suffers no disgrace) on the dreamway. Dreamway-farers stop short before they meet with danger. Many are seen stirring abroad in the dreamway for it is known that the world is full and rich. The dreamway-farer is learning to access his own vast inner world. The dreamway is a learning way. On the dreamway, others are seen as they would want to become. Children in the dreamway are closely studied for lessons they give. In the dreamway, all are becoming, even the dead. The dead live with us on the dreamway, we are merely the thin edge of the living ones. What survives at birth proceeds along the dreamway. The dreamway is now clear, now dimly lit, a highway, a path by water. The dreamway loves to tolerate, but does not encourage fools. The dreamway is not too simple for you, or too difficult for you either. Along the dreamway there are obos. Small work on the dreamway is small prayer. 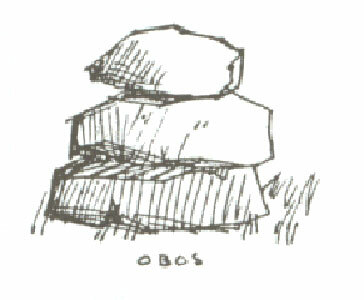 The obos is a meeting place for fellow dreamway-farers. The dreamway seems outrageously (natural when you are on it). The dreamway gives life, nurses, feeds, and sees to the bearing of fruit. The dreamway is what you know without knowing. I can still see through the closed shutters on the dreamway. The people of the dreamscape stay in delicate balance with the fruits of that place, and there is no want. The dreamscape is a love poem of the most sublime tenderness and circumspection. Mist rises in the dreamscape and reveals a new temple that always was there. In the dreamscape, you go ahead with your pure plans against all odds and there is always time for kindness. In the sky above the dreamway, (the man-o-war rides joyfully) and loves his power. In the dreamscape poolside, compatriots use the same sun but (darken) differently. On the dreamway, the light of the crystal is good enough to protect us from misfortune. Along the dreamway, we are enriched by minor troubles. Hold tightly to the small child of your arms and release the growing child to the arms of the dreamway. (I feel myself to be) the dreamway. Children and elderly are alike and unbored on the dreamway for they are selves sooner and later. There is waiting; waiting to come, and waiting to go, but it is quite tolerable on the dreamway. The dreamway is dedicated with the thrown flowers of kindness. Craftspeople on the dreamway are known for the sharpness of their tools. Thievery has come to a standstill in the dreamway because there are no laws. The dreamway has prosperity, plain and unmeddled. There are disasters on the dreamway but they are needed to create the good fortune that follows. All are becoming; crafty becomes direct, monstrous becomes good, particularly as they enter the dreamway. There is more reflection and shine than there is dazzle. Right now, the dreamscape materializes as a whole, but I know that it has parts. On the dreamway, injustice is repaid with kindness, or one moves. When the state atrophies, as it has on the dreamway, a commonwealth of humanity arises. If work was ever taxed on the dreamway, then so would prayer be. No one has to stop and think who they and others are on the dreamway; it is common knowledge. At dream’s length, the dreamway in its entirety can be cupped in your hands, if only for a few seconds. Virtue comes readily like grains to the hand when one bends down to gather on the dreamway. Love abides well while it is kept waiting on the dreamway. Someone tries to dream their limit on the dreamway. The wealthy carry their riches quietly on the dreamway. Strong crops never fail from too much (nutrient) on the dreamway. Each attributes merit to the other along the way. On the vast dreamscape, the streams of the universal world unite and part again. In the wide dreamscape, very few are truly extraordinary, but at close range, you are one of the few. On the dreamway, one sets up a rearguard of beautiful deeds. No one is abandoned, for the dreamway itself is home enough. Gaining something is giving away your best efforts along the dreamway. Large works encountered on the dreamway are seen to be many little works. There are no promises on the dreamway; no one knows exactly what anyone will do. (There are many pessimists) along the dreamway and they are never disappointed. The dreamway becomes difficult at times; there is little guidance to what lies ahead. Brittle things break and small things dissolve on the dreamway. That which looks untidy on the dreamway will often be in great order. Things that need order are well organized on the dreamway. Downy seedlets of great trees search out the warm dreamway soils. Great journeys on the dreamway start with the space between one’s feet. Your spirit is unsure until you have completed the dreamway, and you never do. When the unfinishable is finished, then you can make up your dreamway mind about it. The game is in the dreamway court and the court is in the dreamway game. Small fishes swim untouchable in a dreamway aquarium. It is known in the dreamway that weakness may be mended temporarily with the soft glue of guilt. Fiction and illusion are a joy of the dreamway. In the dreamway, all meetings are fortuitous for we need everybody we meet. Females take to the space of the dreamway just as males do. Connections are found under (subtly) marked stones on the dreamway. Now there is often sobriety in the public houses, and amusement, even hilarity, in the churches and mosques of the dreamway. The churches of the dreamway transfigure into galleries, theatres, museums, libraries, meeting places. In the dreamway, scholars begin to be taught that which cannot be counted, or put in order, or even taught. A dreamway beehive, stoppered against escapees, is held for its knowledgeable hum. In the dreamscape, contradiction is a principal order. The territory of the dreamscape expands with frugality. Compassion on the dreamway is used to toughen up courage. The employer excels in his employership through his humility. The dreamscape is sublime in its non-violence. In a dreamscape home, the host is guest and the guest is host. The song moves us in the dreamway even though we do not know the words. Anyone on the dreamway may carry a crystal in his pocket. Anyone on the dreamway can learn to use the resource of insecurity. The painter in the dreamscape lets the painting complete itself, because it knows where it is going. You will be seeing auras on bollards along the dreamway. I carry whatever load I can carry on the dreamway. In the gardens of the dreamway, the peacock displays, the peahen lays. One is attracted to another without summoning on the dreamway. The dreamway is of sleep and sleep is of death and dreamway-farers do not give it much concern. Let us not pass up the great riches that we have for each other in this dreamscape. The strongest of trees must be careful for the dreamscape has a forest of axmen. For a while you have it, then it is gone, and lost. The servers are no greater than the served in the dreamway public houses. In the dreamway, some things seem poorly formed but they work perfectly. The dreamway is only glimpsed but it gazes back at you. Their clothes find them slender and beautiful on the way of dreams. People shout dealings over the lines which crisscross the dreamscape. It is possible to be brutally kind to one another on the way of dreams. Kindness pulls everyone into the dreamway like a strong undertow. Dreamway-farers always take the rose, or the wild daisy, for they are worth any money. Dreamway-farers know that not to know is the beginning of knowledge. On the dreamway, there is always half left to give away. Many dreamway-farers try to find again the places of their birth. From the high hills on the dreamscape, we behold the arrivals and departures of our ships. When leaving a place along the dreamway, we take that place with us and we leave ourselves behind in that place. One does not stay longer in one place on the dreamway than one needs or is needed. The dreamway crackles where the sea meets the edge of the land. Small births and small deaths on the way of dreams. What is most important to say about the dreamway is mainly unsayable. There is neither too much comfort nor too much contentment on the dreamway. Trying love is a (principal occupation) of the dreamway. Celebrate your arms and legs for the quadraplegics who roll on the dreamway are beyond jealousy. When your things are tidy, you can fly effortlessly along the dreamway. The most unfamiliar sepulchre is for your spirit too on the dreamway. One who knows exactly what to do on the dreamway is the cat. The craftsmen of the dreamway guard and trust their tools and materials as they do their instincts. Pride flows when production begins in the studios and factories of the dreamway. Some on the dreamway never cease their toiling and they are none the worse for it. The excessive shrinks from the dreamway to make the deficient more whole. Tasks are completed along the dreamway with no claim to merit. There are inconspicuous shrines here and there on the dreamway. A glance and a smile are a shrine on the way of dreams. Is there something else moving my hand as I move along the dreamway? On the dreamway tundra, they are seen bowing to the larks and the snow buntings. On the dreamway there is progress: everyone moves forward, but someone always comes back to tell the story. There are all manner of connections under the dreamway stones, even answers to questions which have no answers. Along the way trees are planted which are not expected to bear fruit in one’s lifetime. Mothers and fathers, sons and daughters, wives and husbands, complete on the way of dreams. There is no limit to the variety of badges and cards under the sky of the vast dreamway cathedral. There is more on the dreamway; much more, much more. When you leave the dreamway, you can be sure that it continues. Simple but valuable ideas are often heard repeated on the dreamway. On the dreamway, the peace is fairly perfect. The game on the dreamway is perfectly fair. The badge is more often given than bought. Crystals, our symbols; obos, our art; and we are the craftspeople. Pure attraction guides the dreamway-farers. Be ready for the opportunities in the dreamway delays. Habits are more holy than messiahs on the dreamway. The bond of intimacy connects and connects until all are connected on the way of dreams. Delight on the dreamway is the feeling of fragments. Good manners and gentle bearing surprise no one on the dreamway. Imagination puts wings on worms on the dreamway. Dreamway art has craft and skill and is worthy of enthusiasm. The dreamway physician thrills to make you swiftly better. When there is no one handy to love, there are always the dreamway puppies who know no limit. Students are eager to learn and are patient with the dreamway instructors’ presentation. The great dreamway teachers tell of first-hand experiences. Fiction and illusion are an enjoyment on the dreamway, but dreamway-farers are just barely able to live without lies in public, no matter how comforting. You are sincere; it is a possibility, but it is quite unlikely. On the dreamway, good luck is given to the benders of human minds. There is mild happiness because they are lost in play. The playing field on the dreamway is crowded with contenders. On the dreamway, the chosen people are the people. We eat lightly on the dreamway, for we are not bored. Wayfarers make multiple use of their forays along the dreamway. Music on the dreamway is beyond dreams. The dreamway grows quiet and it narrows to a (barely discernable) woodland path. The silver clock ticks and hums and then grows silent, only to tick and hum again on the dreamway. Stop your begging and just take the dreamway gift. Love is made in countless ways on the way of dreams. Finding out one’s true name is a constant pursuit of dreamway-farers. How fragile are all the parts, how strong is the whole. You have a connection with a special person who has connections, and he travels right along with you. Misted silence overtakes as the dark forest dreamway dissolves and finds itself again. Tiny white flowers caress my delighting feet as I float along the dreamway’s pristine path. In all my dreams, the dreamway has never been so clear in its simplicity, or simple in its clarity. Someone beautiful waits for me in the mysterious half-light of the dreamway. Thank you so much, Robert, wherever you are in heaven, for taking the time and trouble to record and to document this. Now, 17 years later, I so enjoyed reading it. It fed my imagination and my soul, and that’s no small gift. “ACCEPT THE GIFT”, she said. And thank you, Sara, for quoting from and linking back to this on October 9, 2018.